Compelling Instagram captions will lead to more engagement. And engagement is one of the key three things the Instagram algorithm considers when ordering content in users’ feeds. Get more likes and comments, and your followers will see your photos and videos more often. 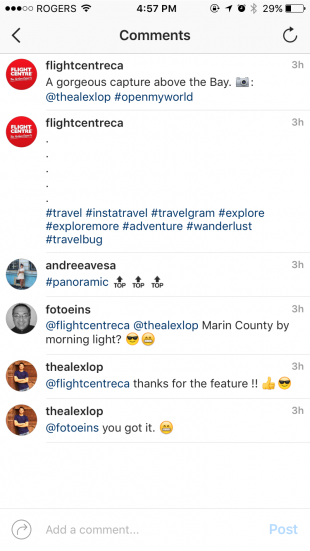 Read on for a list of winning Instagram caption ideas and get tips on how to write your own. What makes a good Instagram caption? A great Instagram caption will add context, show off your brand’s personality, entertain the audience, and/or compel people to take action. Captions can be up to 2,200 characters in length, include emoji, and up to 30 hashtags. Of course that doesn’t mean your captions should be hashtag-ridden essays stuffed with cryptic emoji messages. As with any piece of good web writing, your Instagram caption should be attention-grabbing and easy to read and follow. It should also speak to the content and the audience. Here’s how to write your own captions to boost engagement. Who of Instagram’s 1 billion million users fit your business’ target customer profile? Instagram demographics show us that the platform is used by people in all income brackets, and is slightly more popular among women than it is with men. But those are the broad strokes. The better you know your audience, the easier it is to tailor your Instagram marketing strategy to their needs and expectations. To that end, we recommend building audience personas. These archetypes outline basic details about your target customers, their goals, and their pain points. Our guide to creating audience personas outlines the questions you need to ask yourself to determine who your customers are. How old are they? Where do they live? What sorts of jobs do they have? What do they do outside of work? Will my audience understand this reference? Do I need to add more context to this post? Answer those questions, and actioning on the next step will be much easier. If you haven’t identified your brand voice as part of a broader social media marketing strategy, ask yourself: ‘What are the qualities and values I want my brand to embody?’ Make a list and use it to shape your voice. You might also try jotting down a few adjectives that describe your business and use those to find the right tone. “Bold,” “curious,” and “authoritative” might make sense for a travel brand, for example. In general, Instagram users don’t expect a formal or serious tone. Of course it depends on the industry and audience, but you should strive to keep things light, use humor where appropriate, and show personality. The people behind Lego’s instagram account do a great job of this, combining humor and whimsy to tell the brand’s story. If you want your entire caption to display, Instagram recommends using 125 characters or fewer. That said, if there’s an interesting story to tell behind the photo, take the the time (and the generous character limit) to tell it. National Geographic’s Instagram account is one of the best at longer-form captions. As impressive as the brand’s visuals are, the accompanying text always adds value. For further reading on this point, check out our guide to the ideal social media post length for every network. Again, captions are cut off in users’ feeds after a few lines of text, so you need to convey your key point or call to action right away. Put any @mentions and hashtags (more on those later) at the end. Make sure every word supports the content and message you’re trying to convey. Cut out words that are clearly unnecessary to keep it as concise as possible. You should also have someone else edit your work. A fresh pair of eyes will pick up mistakes you may have gone blind to after spending so much time staring at the text. With a social media management tool like Hootsuite, you can set up your teams and workflows for post review and approval before any content is published. More editing tips for social media marketers here. Use hashtags that are relevant to your post and target audience. And don’t use so many that they crowd your copy and make it difficult to read. Separate your hashtags from the rest of your caption by burying them beneath periods and line breaks. Once you’ve finished composing your caption, tap the 123 key. Select Return and then enter a period, dash, or asterisk. Repeat those steps at least five times. Because Instagram caps off captions after three lines, the hashtags won’t be viewable to users unless they tap the “More” option. Don’t put hashtags in your captions at all. Instead, write them in the comment section right after you publish the post. Once other people leave a few comments, the hashtags won’t be viewable unless the option to See all is selected. One of the easiest ways to get more comments on your photo is by using the caption to pose a question to your followers. It could be a skill-testing question, an open-ended question, or multiple choice. You could also use the caption to get tips or recommendations from the audience. Does your post feature another Instagram user? Include their username in the caption so your followers can check out their profile too. By mentioning another user in the caption, you’ll likely compel that user—and possibly some of their followers—to comment on, like, or share your content. Alternatively, you could make your call to action too good to refuse. Run a comment-to-win contest with a cool prize. The animated icons can help draw the reader’s eye in and are a great way to add a bit of personality. Emoji can also stand in for entire words, keeping your copy short and fun. #LoveIsLove is ❤️ is ❤️. #Pride ????️‍???? Not the cliché inspirational variety, but ones that are specific to the post. Maybe it’s a quote from the person who captured the photo, as GoPro often does with their user-generated content. Or it could be a quote from the person featured in the post, as Nike has done with this video starring soccer star Neymar da Silva Santos. 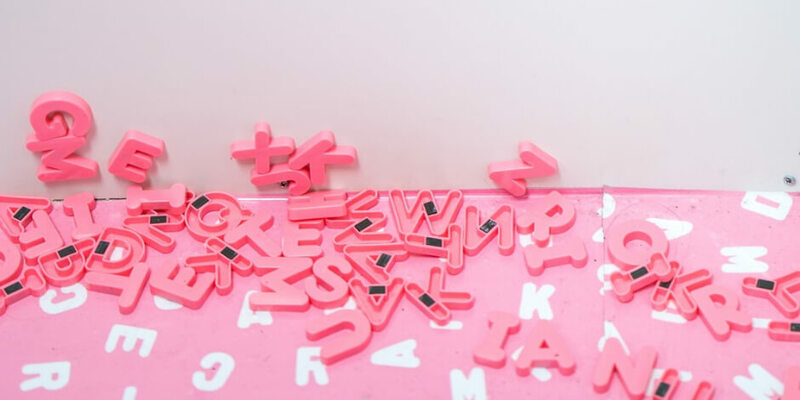 Now that you know how to write great captions, let’s look at some of the most effective caption types and how successful brands use them to engage the audience. Airbnb uses captions to compel followers to click the always-rotating link in their bio for more information, and/or check out their latest Instagram Story. What started as “A Good Night” became so much more. @JohnLegend turned an intimate poolside concert at a historic Bevery Hills villa into an unforgettable party with a purpose. All fees went to his @letsfreeamerica campaign for justice reform. ⠀⠀⠀⠀⠀⠀⠀ Watch our Instagram Story to see how the night went and click the link in our bio for more #AirbnbConcerts that feature extraordinary artists in unique spaces. Instagram is a great platform for behind-the-scenes content. Lush Cosmetics often explains how their products are made in their captions. 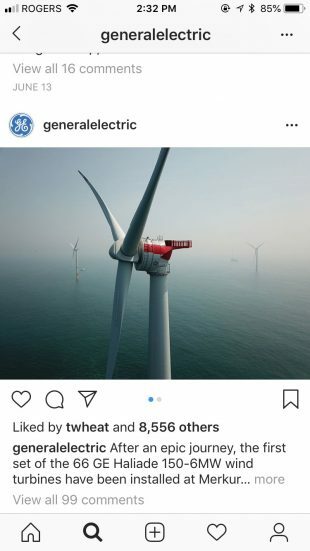 General Electric’s Instagram captions are full of compelling facts about science, nature, and company initiatives. Tasty, BuzzFeed’s food channel, pairs step-by-step cooking videos with the recipe itself. Simple + useful = a great caption. There are few things on Instagram more appealing than the promise of free stuff. If you’re running an Instagram contest, promote it in the caption by explaining to the audience how to enter and what they can win. Introducing a new take on Secret Santa ????????. Twelve Instagrammers plus all of you. Here's how it works. 1. We'll reveal each Instagrammer's Secret Santa on our feed 2. You tag a friend that you want to surprise in the comments (tell us a little about them) 3. We'll pick one person in each post to receive a gift ————————— To start things off our dear friend @kimathomas got @katewinsy our Cotton Tank and a pair of Leather Street Shoes. Congratulations to @white_lux, your Secret Santa is @carrielondon. If your post needs context, then by all means take advantage of Instagram’s generous character count. You’ll be hard-pressed to find any brand on Instagram that tells more compelling stories than Humans of New York. We’ve already stated it in this post, but it bears repeating: if your content is attention-grabbing and speaks for itself, a short caption is best. Here are a few apps and tools to help you write the very best Instagram captions. Captiona will help you come up with ideas for your captions. It works like a predictive search engine. 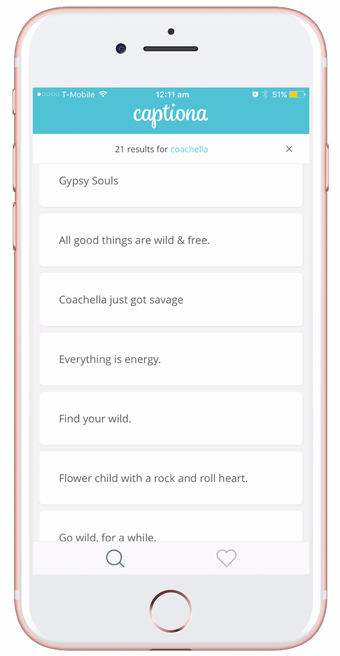 Enter a keyword that relates to the content, and the app will deliver a list of suggested captions. While you should always strive for originality, if you’re stuck you can use it as a creative springboard. Riff off the suggestions, but don’t copy them verbatim. Be original to standout from the crowd. Named for Ernest Hemingway, the desktop tool promises to make your writing “bold and clear.” It analyzes text and, with color-coded highlights, points out where your writing has become sloppy or indulgent. This allows you to easily cut down run-on sentences and swap out needlessly difficult words for simpler alternatives. Readability is key, especially on a medium like Instagram where users scroll through content quickly. 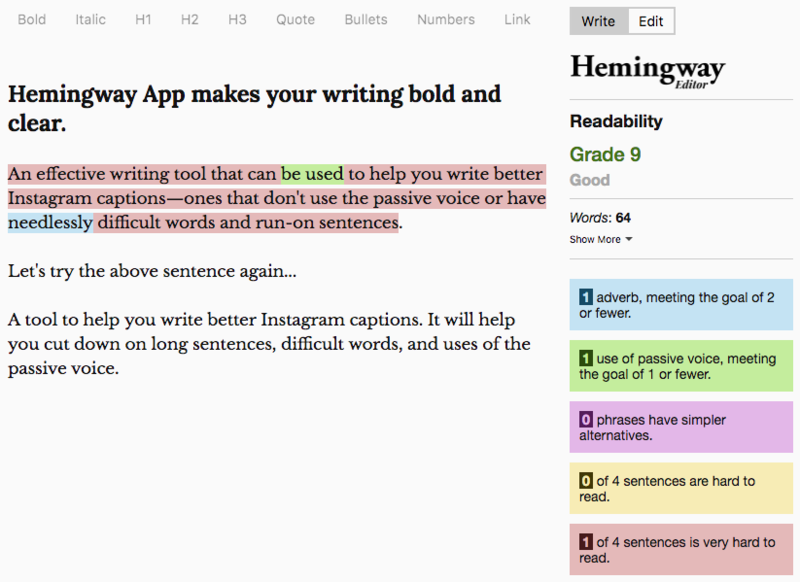 The Hemingway app will help you craft clear, punchy copy that draws in a scanning set of eyes. 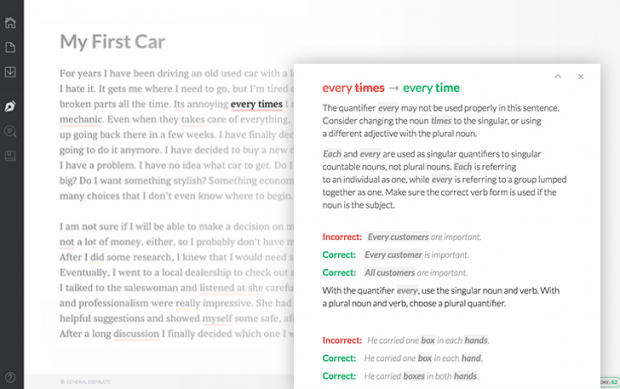 Grammarly will catch errors that most traditional spell check tools miss—everything from inconsistent use of tense to missing commas. The tool will even offer synonym suggestions to help add variety to your writing. And that’s it. You have the ideas, tips, and tools to write compelling Instagram captions of your own. Now get posting. Easily manage your Instagram presence using Hootsuite. From the same dashboard that you run all your other social profiles from, you can schedule and publish posts, monitor performance, and much more. Try it free today.